So there's an opportunity for the community to be exposed to the Gospel or to just establish relationships with Christians in the area. There are multiple ways to advertise such events. Be sure to advertise. Beautiful postcards are easy to produce and relatively inexpensive. 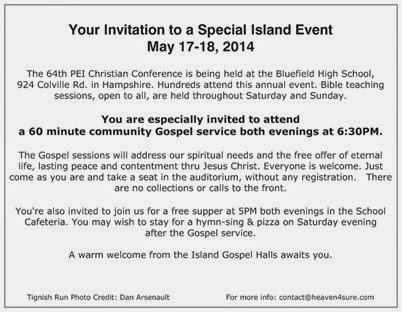 Our annual Christian Conference is held in May each year. So we found a local May scene that would be meaningful to the local public. A suitable and appealing Bible [Gospel] verse was selected for the scene. The details of the event were provided on the reverse side of the card in black and white. The quality of the actual image and printing on the card is far superior to what is shown above. You can shop around. We have used www.vistaprint.ca for a couple of years and have been satisfied. You can upload the images to their website and design your postcard - back and front - all online. It is very user friendly. If you want an idea on the price - as of May, 2014: we ordered 1000 glossy finished coloured postcards on card stock - black and white on reverse side, with 250 matching envelopes. Total price, including shipping, was $78.06 and was received within 10 days of placing the order. 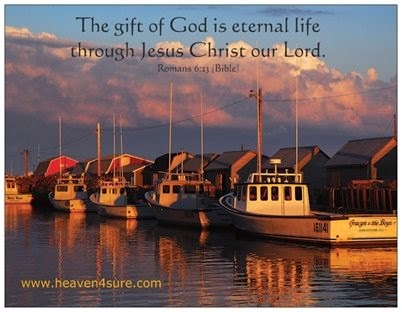 These postcards are available to all the Christians for their distribution. The 250 matching envelopes are available for community contacts to whom Christians may want to mail personal invitations as opposed to hand-delivery. If there is a website connected to the local event, be sure to include it on your invitation. Association, World Conference Held 5 days in 2010 August in Stockholm Sweden in Claronton Hotel. Which I am Attended. Saw How the World going Down Spiritually, Learned to develop ministry. With urging , to Support my Evangelistic and Mercy ministry 100 Papers Distributed, Non-replied. This is my First Visit to another Country. I am not came to Germany. Nobody knows me, in another Places. This is my History.